← I am sure Leornardo da Vinci would have happily patronised the Fleet Air Arm Museum. 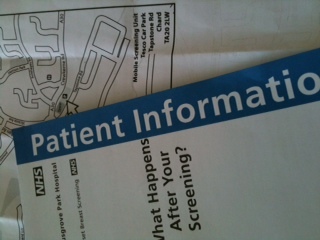 When I received a letter from the Somerset Breast Screening Centre, the alarm bells started to ring. Why had they contacted me? What did they know that I didn’t? Having had the X-ray, would I go through days of mentally debilitating torture whilst I waited to hear the worst? I cannot deny I do have a tendency for the dramatics – it goes with the territory of being a writer – and when I calmed down I realised it was probably part of the Government’s drive toward preventative health care as the letter said they are now ‘inviting’ women under the usual age bar of 50, to have a mammogram. Now I don’t pretend to know how much this procedure costs but I think it’s fair to say it’s not cheap and my particular invitation was to join them in the Mobile Screening Unit in Tesco’s Car Park (I know, not the most salubrious location or indeed an area associated with aspects of female medical checks). So on top of the X-ray procedure itself, there is the cost of transporting the mobile unit, the expense of the generator that I could hear rumbling away in the background and I wonder what Tesco charged them given the usual 2 hour time limit they allow you in their car-parks? So there is no doubt the whole event was costing someone a great deal of money and effort. And not wishing to miss the opportunity of being told there is at least one part of my body that is in reasonable nick, I decided to attend. Now this wouldn’t be the first time I have focussed on this part of my body, the last time was around 5 years ago when I put myself into such a blind panic when I discovered some lumps that turned out to be nothing more than my own less than smooth flesh. But at the time, my whole world came crashing down on me. From the moment I had the X-ray I thought that was it, my time was up. The act of being scanned for breast cancer was the beginning of the end as far as I was concerned (I did warn you about the drama!) and it was just a matter of time before I was having invasive treatment and regular trips to the hospital. Those few days between having the test and getting the result were purgatory. So this time round, I was slightly less agitated as it was not me instigating the event but the ‘system’ so it seemed somehow less threatening. So having endured the torture of the Tesco aisles I made my way to the large white mobile unit that was parked in the far corner. Now there is something odd about buying your fruit & veg then popping out into the car-park for an X-ray, or is that just me? I felt like I was taking part in some dodgy deal as I walked head down just in case I caught the eye of anyone I know…. 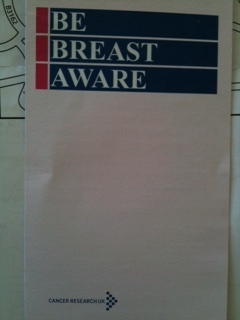 “Oh hello John, just going to get my breasts X-rayed. See you at school pick-up.” You see what I mean don’t you? OK it’s not dodgy or dubious but it’s not what you think about as you decide on BOGOF’s & sell-by dates! The procedure was uncomfortable and not one I enjoyed (rather like another examination we ladies have to go through every 3 years) but I got on with it because the consequences of not having it done are far worse. When Hollywood actress Angelina Jolie was told she had an 87% risk of breast cancer, in February 2013 she decided to undergo a double mastectomy to reduce the chances of suffering from the disease. I disliked having it done and I dislike the other test even more but given the alternative, I would far rather feel uncomfortable and awkward for a few minutes than risk the possibility of being destroyed by something far greater than my sensitive level of dignity. So if your check-up is overdue or you keep putting it off either because you feel ill at ease or are worried what might be, just put your head down, don’t look around and get the job done. The probability of anything being wrong is miniscule but the reassurance of knowing there is nothing wrong is enormous. This entry was posted in Health and tagged breast screening, cancer, cancer research, check-up, hospital, mammogram, mastectomy, medical, treatment, x-ray. Bookmark the permalink. My mother was diagnosed with breast cancer at 84, had a maesectomy (sp?) and lived a full and happy further 2 years. Please get checked and checked regularly. That’s remarkable Tony, particularly as they now no longer send reminders to women over 70 years old i.e. it is up to the individual to arrange check-up. I had a scare two years ago. I went to the doctor having found a lump but was completely expecting her to say that all was OK and there was nothing to worry about. Instead she found two more lumps and appeared more panicked than I was! Events then escalated very quickly indeed. She informed me that she would refer me to the hospital and I was expecting to receive a letter in the post, instead less than an hour after returning to work the doctor had phoned the office with an appointment time! I was astonished at how quick things were progressing which was incredibly scary. I only had to wait a few days to be seen but those days were pure torture, I could not look at my husband or daughters without bursting into tears, fearing the worse and imagining their lives without me. As it happens I went for a mammogram and it revealed that the “lumps” were nothing more than “folding tissue” but sitting in the breast clinic for the afternoon is an experience I will never forget and hope I will never have to repeat. One by one women were called in to see the specialist and one by one they re-emerged with either a look of total relief or that of utter anguish. When I came out of the appointment and had to walk past the other women waiting I tried to remain emotionless. All I wanted to do was smile with relief, hug my husband and go home to my girls but I was very aware that for a large proportion of those women waiting, it was going to be a day that changed their lives and the lives of their families forever and not in a good way. Since that appointment a friend I went to school with has been diagnosed with breast cancer, has had a major operation, chemotherapy and radiotherapy and has shared her whole experience with her friends on facebook. Throughout she has kept her sense of humour and has turned her personal battle into a very positive experience, raising funds and keeping us all entertained with the numerous characters she has created with her hair loss and her exceptional collection of wacky wigs! She has now had the last of her treatment, been given the all clear and has even managed to land her dream job in the process. She has fought this awful disease head on and has been so brave throughout the whole process and when I look at her and what she has been through I do so with great admiration as I know I wouldn’t have been able to have faced it in the same way. I also realise that despite the awfulness of what she’s been through, she has been incredibly lucky to come out the other side. It’s never an easy topic to talk about but examining yourself and keeping these unpleasant appointments really can be the difference between life and a death sentence. Well done Sophia on raising the topic and talking honestly about your experience with the mobile unit – far better to be seen in Tesco than not be seen at all! Thank you Maria for sharing your experience, it really does remind us all just how fragile life can be & how instantly something we take for granted can be taken away from us. And what an incredible journey your friend has been on and thank goodness she has made it through, I would imagine a stronger person than when it all started. I think the whole breast aware campaign & cervical tests are understandably unpopular with us all, none of us like having it done, but as you and your friend have shown, it is so important to have the check ups. Thank you again Maria, it can’t have been easy reliving that awful moment even though it turned out to be such good news.